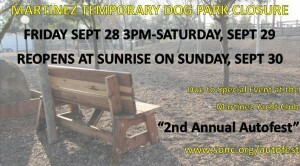 Dog Park will be CLOSED Friday 9/28 and Saturday 9/29 to accommodate The Special Olympics 2nd Annual Car Show!! 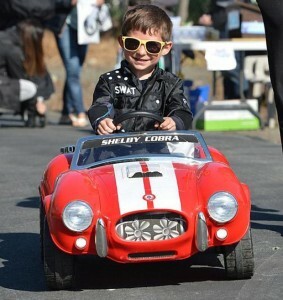 If you have a passion for cars and love to show off your pride and joy, you’ll want to be a part of this car show. Pre-register your car and only pay $25. Day of registration is $35. Registration includes a t-shirt and dash pin. Trophies will be presented in a variety of categories to the top cars. While you’re scoping out the competition, be sure and enjoy the beer garden, food booths and live music. This is definitely an event for the entire family to enjoy! 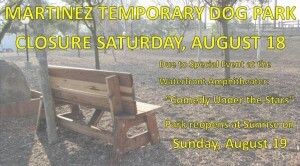 In order to accommodate the upcoming August 18th “Comedy Under the Stars” special event at the Waterfront Amphitheater, the Temporary Dog Park will be closed Saturday, August 18th. Signs will be posted at the Temporary Dog Park prior to the closure. Please plan your visits to the Temporary Dog Park accordingly. If you have further questions about this planned closure, please contact Martinez Recreation at (925) 372-3510. Mark your calendars Martinez Temporary Dog Park Enthusiasts – Closure of the Dog Park will take place from dusk on Saturday, June 9th through noon on Monday, June 11th due to the Annual Bike the Bridges and Brewfest event on Sunday, June 10th. 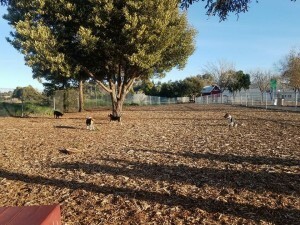 The city will be putting in a new finer chip material into the Small Dog Park. This will be installed this coming Monday, May 14th. There will be some City machinery and crews working in the park and because of this, the park will be closed until 2 p.m. that day instead of the normal reopen at noon. Attention Martinez Temporary Dog Park Enthusiasts – Closure of the Dog Park will take place the morning of Saturday, March 24th until 1pm due to the City’s Annual Mini Motorland. 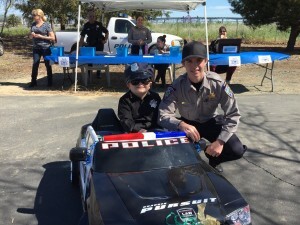 The Martinez Waterfront Amphitheater will be transformed into a child size interactive village, navigated by rideable toys, trikes and bikes from 10:00 am-12:00 pm. 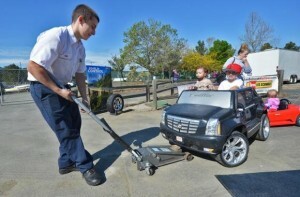 Over 100 children and their families are expected to attend the fun-filled morning. The Dog Park will not be used for any event activities and will remain closed. Clean up is expected to be completed by 1:00 pm – at which time the Dog Park will reopen. If you have any pre-school aged children, we encourage you to attend. You can sign up online here! Please leave your dog at home until the event is over. 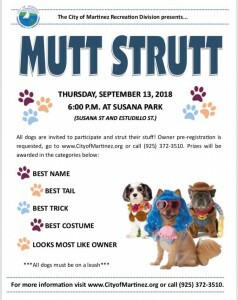 Thank you for your continued flexibility and understanding in sharing the Martinez Waterfront Amphitheater and Temporary Dog Park with our upcoming event. The Martinez City Council adopted Resolution No. 039-17 on April 5, 2017, which designated the John Muir Amphitheater (also known as the Martinez Waterfront Amphitheater) as a Temporary Dog Park Site for a period of up to three years from the first date of public use, and allocated $50,000 to help fund necessary improvements. Since receiving City Council approval to proceed, City staff transformed portions of the Amphitheater into a Temporary Dog Park, which opened to the public on July 14, 2017. This exciting space near the marina has become a communal spot for dog owners in the area and is enjoyed by many dog-loving enthusiasts. The City recently installed a sign-in guest book near the entrance to the small dog area in order to better track ongoing park usage, at the suggestion of the Parks, Recreation, Marina and Cultural Commission (PRMCC). The City commonly tracks and reports on activities and usage at other park locations and often has the benefit of data provided through various program or picnic reservations. 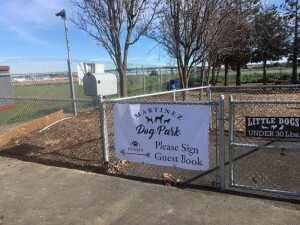 For the Temporary Dog Park at the Martinez Waterfront Amphitheater, the City did not have an effective means to track usage until installing this sign-in book. The City appreciates patrons taking the time to sign in to let us know how popular this new amenity is so that can be passed along to the PRMCC and City Council. The City would also would like to clarify the dog park – which only just opened on July 14, 2017, and was designated as a temporary dog park site for a period of up to three years – is not being closed, as the City continues to explore potential locations for a permanent dog park facility.